This classic novel is given new life in graphic form. 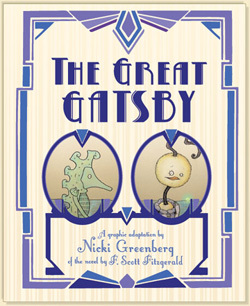 Although Nick, Daisy, Tom and Gatsby become inhuman creatures, Fitzgerald’s characters are true to form in all their tragic grandeur. I love the original and was delighted by this version. The graphics are quirky and poignant. Set out like an old photo album, Nick Carraway narrates with an almost nostalgic tone, at times destroying and then restoring the snapshots that make up the tale. The Great Gatsby is so often defined as a “jazz age classic” and this has been captured through the beauty and flow of Fitzgerald’s words and the movement and use of space across each page.